If you can answer yes to the following questions you'll want to get your hands on the Content For Cash Crash Course Package! Did you know writing and selling content can be an extremely profitable business model and that anyone can use to generate more income? Becoming a freelance writer has many advantages including giving you the freedom to set your own hours, work from anywhere and most of all be your own boss! When it comes to turning content into cash, it can be an extremely effective way to increase your income and it has the potential to bring in a steady flow of profits for anyone who understands the power of the written word. 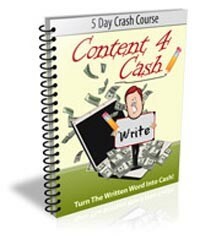 But the simple fact is most people don't fully understand how to turn their content in to cold hard cash! The "Content For Cash" course was specifically designed to show even absolute beginners how they can start making a very nice income by taking on simple writing jobs. Even if your readers have never thought about becoming a freelance writer or that it is even possible to turn their content into cash before, they will quickly understand how profitable freelancing can be! The best part is with the private label rights to this course not only will you be able to learn the ins and outs of creating and selling content for your own purposes, you will be able to pass that knowledge on to your subscribers. You will be providing them with quality information that will help them understand what freelancing is and how they can take full advantage of everything this profitable business model has to offer! The entire course is completely customizable. With a few clicks of your mouse you can add your contact information to all of lessons in the series at once. "If you can copy and paste, then you'll love how easy it is to put this course to work for your business."